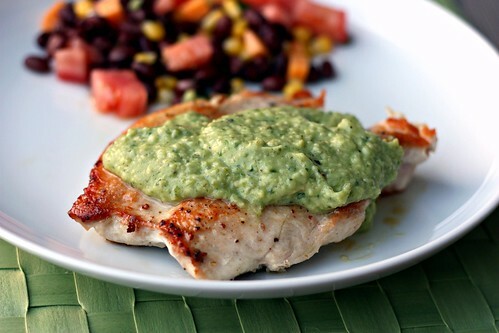 Chicken with Creamy Green Chile, Tomatillo, and Avocado Sauce – Elly Says Opa! I’m pretty excited to share this dish with you for many reasons, the most obvious being that it tastes great and all three of us cleaned our plates. Second, it’s incredibly easy and quick. Third, with spring and summer approaching, it’s a great dish for grilling—and eating. It’s creamy but still light and healthy. When I saw this sauce, it reminded me of a pasta dish I’d made back in the day and really enjoyed. I love the tartness of tomatillos, and I was on board with the addition of the avocado and half and half for creaminess. I used the recipe as I saw it on Our Life in Food (a blog you should visit if you haven’t already because I guarantee if you like the food here, you’ll like it there. We have very similar tastes!). Carrie used half and half, and I did the same since I had some leftover from bolognese. The original recipe uses water, so you could go that route, or a light sour cream or Greek yogurt would work equally well. As you know, I really don’t like cilantro. (Except in Chipotle’s rice. I have no idea why.) I can handle it in very small doses, so I added about 1 Tbsp. cilantro to this, though the original recipe calls for 1/4 cup. Obviously you can leave it out altogether if you hate cilantro. This sauce is not very spicy, so if you want it to be, you should add a second jalapeno. We had this with a black bean/corn/tomato salad thing. The whole meal felt light and fresh, and perfect for an unseasonably warm day (80 degrees in March. In Chicago!). You could easily grill everything rather than broil it, too. Preheat the broiler (or grill). Place the onion, jalapeno, poblano, tomatillos, and garlic in a broiler-safe pan. Drizzle with about 2 tsp. canola oil and broil for a few minutes, until vegetables begin to soften and char. Remove and place in a food processor; allow to cool as you cook the chicken. Add the avocado, cilantro, and lime juice to the food processor. Process until well-combined, and then stream in the half and half until the desired consistency. Season to taste with salt. Meanwhile, cook the chicken on the grill or on a stove. To cook on the stove, place a large skillet over medium heat; add about 1 Tbsp. canola oil. Sprinkle the chicken with salt and pepper. Once the oil is hot, add the chicken and cook for 4-5 minutes per side or until cooked through. Serve the chicken topped with the sauce. Refrigerate any leftover sauce in an airtight container for up to 2 days.